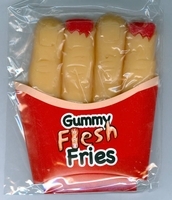 Gummy flesh fries. Talk about gross Halloween Candy. You get 4 cut off gummy fingers some even with blood on them a watermelon flavored gummi complete in a French fry box. These are actually soft and gushy when you touch them sort of gives you the creeps, which make them a great Halloween Candy. You sure won't get these at McDonald's I hope.